"I don't know whether to laugh or be scared," a person can be heard saying in the background. "That's so crazy." 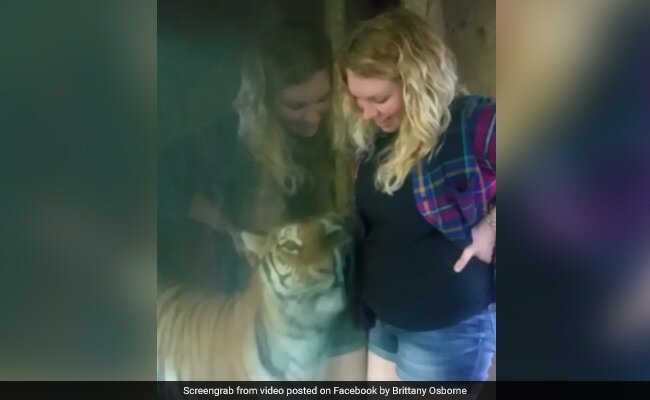 A video of a tiger nuzzling up against a pregnant woman's belly through the glass around its enclosure is viral and has provoked mixed reactions on social media. The video was posted to Facebook by Brittany Osborne after visiting Indiana's Potawatomi Zoo with her pregnant cousin, Natasha Handshoe. "We went to the Wine on the Wild Side event and this beautiful tiger knew that my cousin Natasha Handshoe was pregnant! The tiger was snuggling with her baby bump! It was the SWEETEST (sic) moment," Ms Osborne writes on Facebook. In the short video, the tiger affectionately rubs up against the glass near Ms Handshoe's pregnant belly. "I don't know whether to laugh or be scared," a person can be heard saying in the background. "That's so crazy." Ms Handshoe tells CBS4 that the tigers were sleeping in the back of the exhibit the first time they passed them. She later returned to the tiger exhibit to take a selfie. That's when one of the tigers awoke and started pawing at the glass. "I do believe the tiger knew I was pregnant just by the way it was acting," she says. The zoo also shared the incredible video, writing: "This is why the Zoo is here - to help make connections to nature! Thanks for sharing this amazing video with one of our tiger sisters, Morgana."